El Monte Man Arrested, Being Held on Felony Sexual Assault Charges Stemming from September Crime in Arcadia. Detectives from the Arcadia Police Department, assisted by members of the Pacific Southwest Regional US Marshals Fugitive Task Force, conducted a narrow search for the suspect in Temple City on October 16, 2018. 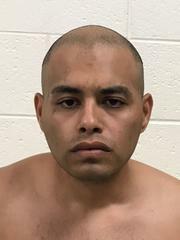 The investigation culminated in the arrest of Robert Anthony Padilla, yesterday, October 17, 2018, by members of a Homeland Security Task Force in Silver City, New Mexico. Padilla is currently being housed at the Grant County Detention Center, in New Mexico, where he will await extradition on felony sexual assault charges. His bail is $1,450,000.00. Padilla is a 26-year-old male from El Monte. The original crime occurred on September 8, 2018, in Arcadia. Padilla was identified through DNA evidence recovered during the investigation. The case is currently under investigation. Anyone with information on this incident is encouraged to contact the Arcadia Police Department at (626) 574-5156, Case # 18-4073. If you prefer to provide information anonymously, you may call "Crime Stoppers" by dialing (800) 222-TIPS (8477), use your smartphone by downloading the “P3 Tips” Mobile APP on Google play or the Apple App Store, or by using the website http://lacrimestoppers.org.